This book is a “workbook’ for the development of techniques involved in gaining exceptional stick-handling ability. There are many roads that lead to this end. However, the majority of the material included here is not found in your average stick control book. 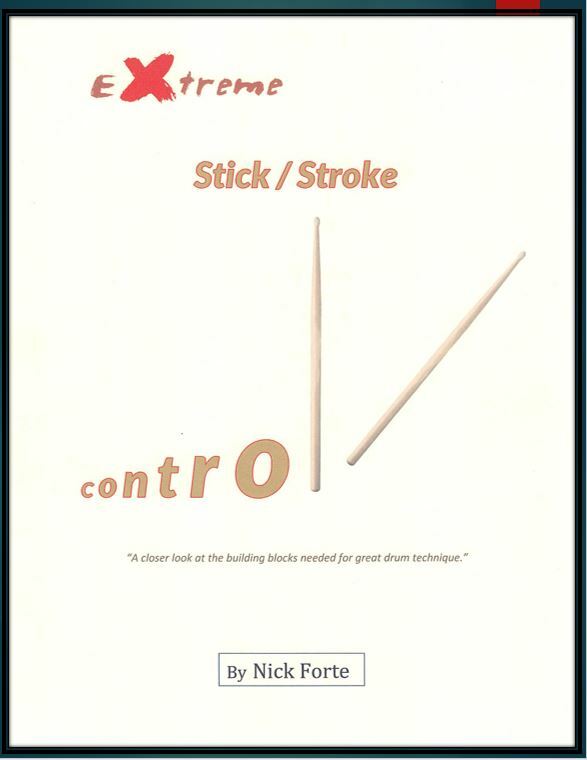 My approach , which comes from fifty years of experience of drumming and teaching, is to explain (in clear detail) how to practice stick control as well as what to practice. This begins with a brief discussion of basic information, such as grips stroke types dynamics, etc. However , students/teachers could choose to move about the book in various ways. The first section of the book deals with developing good form focusing on the snare drum. By good form I mean the ability to execute notes/rhythms in a clear, accurate and relaxed manner. If the hands don’t move smoothly and naturally from note-to-note or drum-to-drum (cymbal(s)) , efficiency in movement , clarity of sound and command of the instrument can suffer. The second section introduces one, two and four-bar stick controls exercises, utilizing the information from section one. It is important, and central to the goal of this book , to practice these individual measures slowly at first, paying careful attention to stroke types and other details concerning good form mentioned above. The third section demonstrates the applicability of stick/stroke control principles on selected rudimental patterns. The point is that rhythms (even rudiments) are much easier to perform if the proper techniques are utilized during practice sessions. Also, this material is a useful and gentle segue into just how this could work with a whole variety of rhythms. The fourth section, Variations On A Theme, adds a bit more challenge to the previous section; namely focus, speed and endurance. This section is presented in a more typical format for stick control studies. However the difference here is that each of the fifty-six “themes” introduces a specific sticking pattern. The objective is to use the previously learned stick/stroke control techniques to master the patterns. The fifth section brings all of the above to the drumset. We begin with an observation of what actually goes on when we play drumset patterns. The concept is simple – we use both hands (with variable stroke combinations) to play a single complete rhythmic phrase. Therefore it is reasonable to study the ” break down” of the individual strokes that make up these rhythms. This means we should study the way (movement) each hand travels over the drumset. These exercises zero in on the core skills for gaining flexibility with a fluid combination of the fingers , wrists and arms. It is important to remember that the goal is to get the arms to move the hands over each part of the kit so that they function at an optimal level – without last-second stabbing and jabbing at the instrument. The benefit is a smooth transfer of energy from the brain to the drums! The sixth section continues with two-hand/drum-to-drum patterns. The conclusion of this section combines the principles of stick/stroke control with coordination/independence. What we are aiming for is complete control over the drumset. This will lead to a better chance of success in any “type’ of music one wishes to pursue. Of major importance is the manner in which a drummer moves in and out of different sticking/rhythm patterns. The best way I know to achieve this is to become very familiar with each of the “stroke types” explained on pages 2 and 3. As you will see, each note grouping (especially if there are accents mixed in with regular notes) is more easily accomplished when a specific system of stroke types is applied. To a large extent good drum technique depends on the ability to recognize rhythmic patterns and quickly implement the best sticking. As far as dynamics, the concept is just common sense stuff. If you must play soft keep the sticks low. If you must play loud keep the sticks higher. If you are to play a crescendo or decrescendo position the stick accordingly, adjusting the stroke height of the sticks to the needed dynamic level. Be very skeptical of those who say that stick height does not matter. Trying to play softly with the sticks flying up 12 inches or more doesn’t make much sense to me. Likewise trying to play loudly with the sticks a couple of inches above a drum (or cymbal) is also an unreasonably tedious chore. The best approach (and old adage) is to “use the right tool for the right job”. The whole point and key to smooth attacks is to move from one stroke-type to another with the least amount of effort. Much of this depends greatly on where the accents are in the rhythm you are trying to play. For example going to a tom from a snare always require an up stroke of some sort to get to a down stroke for the tom note – even a relatively soft tom note. Keep in mind that larger/deeper drums generally require more stick velocity then a snare drum would in the same dynamic range. Also it is important to know that the audience hears your drumset sound differently than you do. This has to do with the study of acoustics. For now realize that your drums (on gigs) will probably need to be tensioned/tuned a bit more “open” (especially in larger spaces and outdoor). With experience, you will learn how to “adjust” yourself and your drums for the best sound in each playing environment. There is a lot to do so let’s get to it!